(green). Check out the How To Cook Everything iPhone and iPad apps, which may change the way you cook forever. 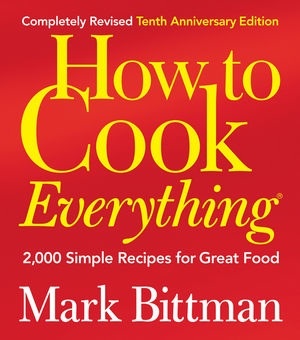 Mark Bittman's award-winning How to Cook Everything has helped countless home cooks discover the rewards of simple cooking. Now the ultimate cookbook has been revised and expanded (almost half the material is new), making it absolutely indispensable for anyone who cooks — or wants to. With Bittman's straightforward instructions and advice, you'll make crowd-pleasing food using fresh, natural ingredients, simple techniques, and basic equipment. Even better, you'll discover how to relax and enjoy yourself in the kitchen as you prepare delicious meals for every occasion. Read an interview with this author.